As with previous posts, this information is based on previous editions. It is possible that the 4E version of Dark Sun will remove or modify the current terrain types. However, this discussion is probably useful because it underscores the incredible diversity found on Athas. Even on Earth, deserts vary greatly in topographical features, micro-climates, temperature ranges, ground composition, flora, and fauna. Athas is a fantasy campaign and one transformed by powerful forces – it should have even more variation. In previous editions, Athasian geography was broken down into six types: Sandy Wastes, Stony Barrens, Rocky Badlands, Salt Flats, Scrub Plains, and Silt. In addition, the Tablelands are surrounded by the Ringing Mountains. Though very few know it, atop and beyond the Ringing Mountains is a ridge of Forest. Forests can also be found in a narrow arc between and around the city-states of Gulg and Nibenay. Each of the terrain types should be considered a starting point and a broad generalization. An area of rocky badlands can include features from the stony barrens where the wind has broken down the rock sufficiently. 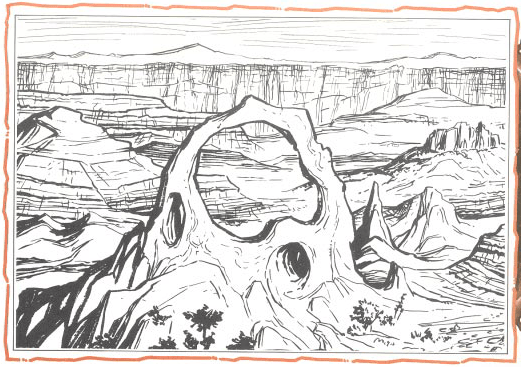 Traveling further, an area of rocky badlands may be sheltered from the elements and receive a small stream from the mountains, causing a small pocket similar to scrub plains. 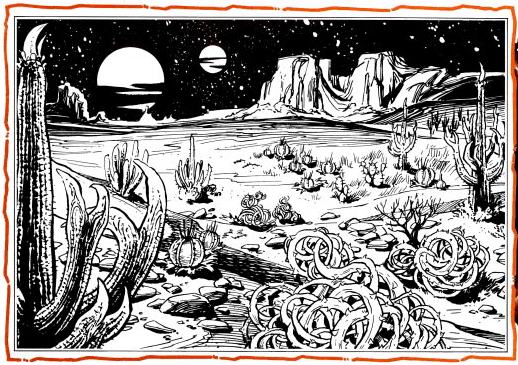 I will try to delve further into ecology in a later session, but for now it suffices to say that terrain should be treated as a classification system and not shackles that confine the campaign. On the other hand, typecasting can be fun and useful. Saying you grew up in an elven tribe that herded kanks in Scrub Plains near Urik can be fun. Terrain types are a good conceptual tool. Here is a description of each of the types. The most common terrain type on Athas is made up of orange-red hard bedrock that is in varying degrees of being weathered. The scouring winds, sun, and even rain (which falls very infrequently but tends to be a brief and raging flood when it does occur) result in everything from small grit and fine sand to huge boulder fields. The result is a very varied and treacherous terrain. Travelers must exercise caution with mounts, as the uneven terrain can render a medium or even large mount lame. Losing a mount can doom a traveler if they do not have enough supplies. A traveler on foot must still travel with care to avoid a twisted ankle or similar injury. A huge beast such as a Mekillot can ignore the uneven terrain and small rocks, but any cart they would pull would quickly find their wheels destroyed. The Stony Barrens are known for an incredible diversity of cacti and thorny bushes. While these may seem inedible, many can be eaten and many can provide liquid sufficient to keep a traveler alive… so long as they know to recognize the safe species. Unfortunately, few live to tell the tales of the harmful cacti such as those that contain poison or lash out with harpoon-like spines. Many of the domesticated animals (Crodlu, Erdlu, Kanks, etc.) can be found here in wild form. Braxat, Belgoi, and Tembo are amongst the dangerous monsters commonly found here. Sandy Wastes are the terrain type most of us picture when we think of a desert such as the Sahara – endless sand dunes stretching across the horizon. This is actually a fairly uncommon terrain type, though it does capture the imagination and certainly exists on Athas. As in real geology, the sand dunes in Dark Sun come in a variety of shapes and sizes due to how various forces (especially wind) form the dunes. Each variety holds different challenges for the traveler seeking to traverse them. In addition, terrible and lethal sandstorms can be created by the winds. Even if the traveler avoids the brunt of the storm, the resulting haze can obscure terrain for days. Mekillot dunes are named for the huge beasts of burden, as they are soft rounded mountains of sand that can be up to 700 feet high! They are usually created by strong winds that pile the sand high. Travel is slow and difficult on the soft shifting sands, though an experienced traveler can travel faster. Navigation is difficult as the horizon is often obscured and lacks defining features. Wave dunes are sharp long ridges of sand up to 100 feet tall. They are created when the wind blows for an extended period of time from a single direction. The traveler can be forced to choose between crossing them (which is difficult) or traveling in a single direction until a break is found… then repeating the process. Crescent dunes are formed when the volume of sand is lower and the surface below is hard. The wind scatters the dunes into a shape similar to a crescent moon due to the wind coming low around the sides. Travelers usually go around them, forcing a meandering but relatively easy path. The shape can offer respite from winds or sun, but also provides excellent ambush points for raiders or hungry creatures. Star dunes form when the wind blows from varying directions, creating tall radial arms of sand. The arms can remain in place for long times, allowing for easier orientation. Some even serve as landmarks. The shifting sands are poor terrain for plants to grow. Oases can be found but may dry out or be buried by shifting sands only to reappear months later. 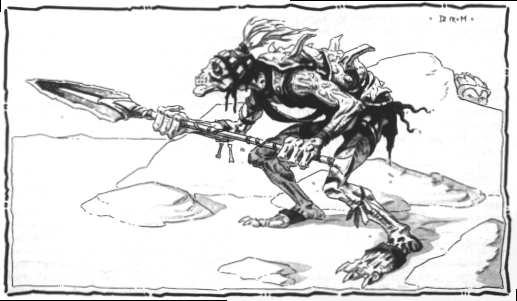 Creatures include a variety of threats that hide amongst the dunes or even below the sands, with Anakore being a common example of the later. Herders and hunters come to these lands of relative bounty. When a rare rain comes, the land explodes with colorful if short-lived flowers. This beauty is balanced by the prevalence of many cunning creatures, including the common Gith and Jozhal. Many will say the true threat is the druids that often protect the lands. If they judge those in their lands to overuse it, let alone defile it, their wrath can be quick and unforgiving. Rocky Badlands are areas of tall maze-like canyons of crumbling rock. (Think of Utah or Colorado in the United States). Relief from the sun is balanced by many other dangers. The land can on one hand hold many oasis and places where fauna and flora thrive. On the other hand, the meandering paths are difficult to navigate as the walls cannot usually be scaled. Many of the plants are harmful to the traveler that is not wise in their nature. Some leaves are so sharp as to kill the animals grazing upon them, while others are poisonous. The area is perfect for ambushes and travelers might stumble upon the secret lairs of those that do not wish to be disturbed. This may include raiders, escaped slaves, merchant houses, secret organizations, or crazed hermits. Belgo, Tembo, and Silk Wyrms are common monsters. Rocky Badlands often surround mountainous areas, such as the Ringing Mountains. Salt Flats are flat rock-hard plains of crusted salt. Water, plants, and game animals are rare to nonexistent. Any water is usually tainted with salt and undrinkable. Because of this, very few creatures make their homes here. Travel is usually fast and easy so long as sufficient supplies are brought for the voyage. Mekillot caravans often travel through salt flats since the wide wheels encounter little resistance. Some city-states mine the salt for use in foods, but there is otherwise very little provided by the land. Some villages hunt snakes, but usually live in border areas and hunt or herd in other types of land. Travelers should consider cloth headgear to protect the eyes – a windy day can cause painful stinging. Most Athasians have heard of the Sea of Silt, which forms a natural barrier to the Tablelands to the South and West. The Sea of Silt is a huge (many assume endless) low-lying area filled with fine grey-white powder. The borders can be shallow shoals, but steadily and often without warning drop to well over a person’s head. A person stepping onto silt falls and will begin to “drown” as they will be unable to breathe when covered by the fine particles. At a certain depth the silt becomes packed and dense enough to support a person, but outside of shallow areas this is usually below the drowning depth. Islands and estuaries are formed by the meandering shoreline. Visibility varies greatly, from seeing endless plains of gray-white dust stretching to the horizon to the wind blowing silt into the air and obscuring everything further away than a few feet and making it hard to breathe. Giants live in the area, usually on islands. Their great height allows them to cross areas most humans could not traverse. The islands can be hosts to many varied and wicked creatures and even greater terrors, such as the tentacled silt horrors (which can consume a giant) that can grasp a traveler and pull them to their death below. Silt Runners are agile but cowardly hunters that rely on numbers to overtake their enemies. Pockets of silt, sometimes called Dust Sinks, can be found in various areas, especially near the Sea of Silt. These pockets may or may not be deep and pose the danger of drowning when they are deep. When silt becomes wet, this creates terrain known as mudflats. Water is hard to find, often already mixed into the ground and quickly consumed by grasses and similar plants. Often the upper level becomes hard cracked mud under the sun’s rays. If the surface cracks under a traveler’s weight he or she can become trapped in a mixture of mud and dust. Mountain ranges are found in small quantities throughout the Tablelands, such as the crescent near Gulg and Nibenay. However, the largest concentration is a massively tall set of mountains that border the Tablelands to the North and East. Tyr is located near these mountains. The mountains are surrounded by rocky badlands. Few travelers brave these treacherous mountains, for they are said to be filled with dangerous crumbling passes, dizzying heights, perilous climbs, and terrible creatures such as giant birds of prey and insects. It is said the climber often loses their mind and gives up, sometimes letting go and falling to their deaths below. A small number of trading houses are said to have a means of securing some goods from the mountains. Very few know that halflings live above the mountains, or that the Ringing Mountains gives way to a lush Forest Ridge. Those hailing from Gulg or Nibenay know that these two city-states are within small forests. The forests are sparse and maintained carefully by the sorcerer-king/queen. A very few realize that there is a massive and lush area of forest beyond the Ringing Mountains, known as the Forest Ridge. The Forest Ridge is filled by wonders, if rumors are true – falling rain, colorful birds, cannibalistic halflings… but it is certain a player character would not have heard such things and would be unlikely to believe them if told. While not a true terrain type, it bears mentioning that the surface of Athas is covered by the ruins of previous civilization. These ruins are an enigma to most, suggesting a time when Athas was much wealthier, resources such as metal were not rare, and when water may have been abundant. Carvings of men in armor made of sheets of metal or boats on rivers will likely confound the player characters. The treasures these ancient ruins may hold and the dangers within is the stuff of adventure. Even without they can make any terrain type more interesting. Edit: Sunwarped Flats are described in a DDI article. The article describes them as “areas where the blazing rays of the red sun interact with the remnants of powerful defiling magic to create pockets of highly unstable terrain where everything from the land to creatures to magic quickly mutates.” (Presumably, this is a new way to describe the effect the Pristine Tower had in the novels and previous sourcebooks, though it is not clear if it replaces it or just adds to that lore). Next: Your continued ideas for future topics are appreciated. I think I will next cover Athasian weapons as it is something players in D&D Encounters could utilize as they use and pick up weapons during the adventure. 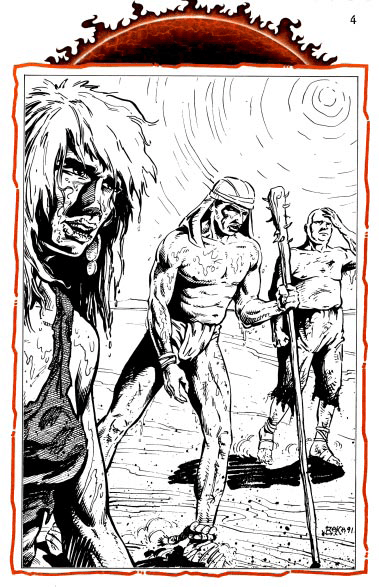 Edit: I was fortunate enough to write an article for Dungeon entitled Traveling the Athasian Wastes. It provides additional information and encounter examples for each terrain type. This entry was posted on October 2, 2015 by Alphastream and tagged Ecology, Setting, World-building.